• Black bean quesadillas on the barbecue: whole grain wraps with spinach, feta and thinly sliced onions or alternatively try cheddar, diced red peppers and corn kernels. Serve with salsa and guacamole. • Fresh made bruschetta: diced tomatoes, minced garlic and fresh sliced basil served on a whole wheat baguette and topped with grated Asiago or Parmesan cheese. • Healthier nachos: tortilla chips with grated cheddar and loads of diced green/red peppers, frozen/fresh corn kernels and diced green onion. Heat in a glass ovenproof dish on the upper rack of your barbecue. Serve with canned refried beans, guacamole and salsa. Make salads more substantial by adding heartier ingredients and sides. • Loaded tossed green salad: mix lettuce with halved grape tomatoes, cucumbers and grilled chicken, prawns or tofu. Add sliced grapes, peaches, strawberries or mango and vinaigrette. Serve with whole grain crackers or garlic toast. • Italian caprese salad: slice good quality fresh tomatoes on a large platter and layer with fresh basil, sliced bocconcini cheese, a pinch of salt and a drizzle of olive oil. Serve with fresh bread dipped in balsamic vinegar and olive oil. Barbecuing is not only good for a hot day but is also great since the clean up is easy. 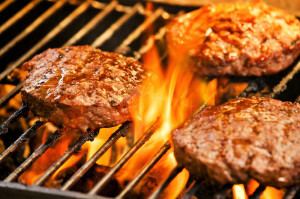 • Burgers: beef/bison/grilled chicken/salmon/veggie burgers are all great options. Serve on a whole grain bun with lettuce, tomato, red onions and sliced avocado. To add some veggies as a side, toss asparagus or halved red peppers brushed with vegetable oil and a pinch of salt directly on the grill. • Grilled meat/poultry/fish/seafood/tofu with baked potatoes or baby potatoes warmed on the barbecue in tinfoil. Invest in a barbecue basket to stir-fry sliced veggies such as Portobello mushrooms, red pepper, zucchini and onions that have been tossed in vegetable oil and seasoned with garlic and dried basil. • Choose a nutritious dip: hummus, babba ghanoush (eggplant dip), guacamole or salsa. • Select a healthy salad: tabbouleh salad, Greek salad, bean salad or a quinoa-veggie salad. • Pre-cut fresh stir-fry veggie mixes or ready to go veggies such as cherry/grape tomatoes, snap/snow peas, baby carrots and mini cucumbers. • Whole grain fresh breads/buns or whole grain/rye crackers. • For protein select bean salad, cheese, make/buy hard cooked eggs or pack leftover meat/poultry or even a shrimp ring with cocktail sauce. • For dessert serve fresh fruit such as grapes, berries, sliced watermelon or other summer fruit. This is a wonderful vegetarian meal for the BBQ. It is great for a speedy weekday supper meal and also works great leftover for lunch. This meal is not only loaded with flavour but also nutrition since it is high in vitamin C, iron, calcium, protein and fibre. 2. 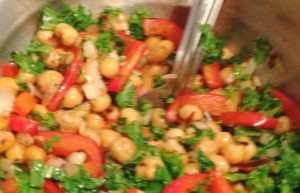 Meanwhile mix together chickpeas, garlic, onion, red peppers and olive oil in a bowl and add to BBQ basket and place on the grill. Stir regularly until chick peas are slightly browned, onions and red peppers are softened and grilled. 3. When almost ready to serve add kale and stir constantly until the kale is slightly wilted. Serve immediately on its own or with garlic toast, pita bread or over rice.